Welcome Spring with a moist and lemony coffeecake from CoffeeCakes.com. This refreshing, citrusy, oh-so-lemmony cake is addictive! 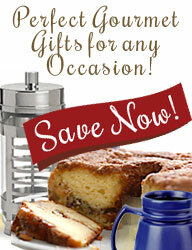 Perfect for gifts, birthdays, special occasions, family get-togethers and so much more. Our version is accented with a pinch of cinnamon and generously sprinkled with poppy seeds. Delicious in Spring, splendid in Summer.... This one-pound twelve-ounce coffee cake serves approximately 10 - 12 and can be frozen up to four months. Kosher Certified and contains no trans-fats, artificial flavoring, artificial coloring or preservatives! Jack Downey swung open the doors to Philadelphia based Downey's Restaurant over 25 years ago, started serving Irish fare and his wife�s cakes for dessert � he didn�t stop with the Irish Whiskey Cake. Downey�s Stoli Lemon Vodka Cake is baked in the tradition of Downey�s specialty desserts, using the finest liquors and liqueurs and baked to perfection. Downey�s Stoli Lemon Vodka cake is a moist, rich cake steeped with a generous portion of Stolichnaya Limonnaya (Lemon) Vodka. The rich one-pound cake serves approximately four to six and will keep one year if unopened. Store in the refrigerator when open. Heat the cake just enough to melt the sugar in the liqueur - perhaps 30 seconds in the microwave - and serve it plain or with whipped cream and fresh fruit. Watch beauty unfold before your eyes. Drop a Flowering Tea rosette into the clear glass pot, pour in boiling water, and the rosette slowly opens into a fabulous blossom. This Flowering Tea Gift Set is comprised of nine flowering teas � four white teas, three green teas and two black teas and comes with a fourteen (14) ounce glass teapot and is packaged in a reusable mahogany bamboo case. This flowering tea gift set makes a welcome gift and a singular conversation piece.